You’ll recall in yesterday’s post I was quite amazed at the difference in the response I got between hanging a poster all over town, and having my class advertized in La Vallee provincial newspaper, the newspaper having been the most effective! Let me continue my story and tell you about igniting the knitting fires with circular needles. 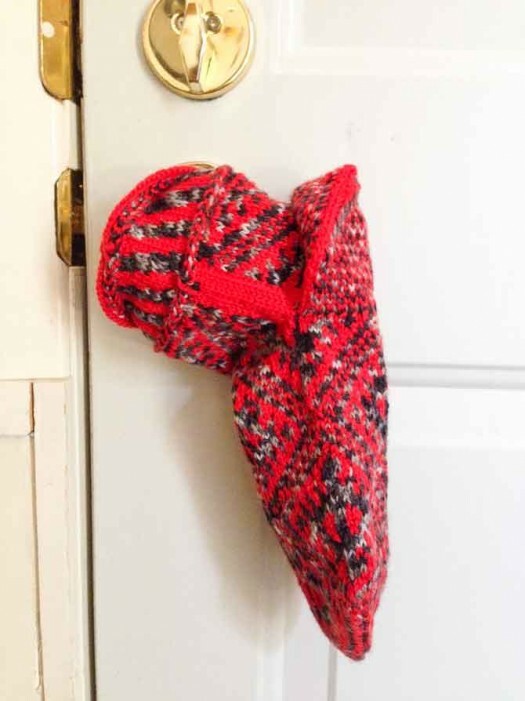 At 13:30, Monday, January 21, I show up at the hall, put a sock on the handle of the outside door, rearrange the chairs and table, place 15 bags with course content and material on the table, place two balls of yarn next to each back and turn down the heat. I also filled the table with the socks I had knit in the past, for them to look at and set as a goal for later. Before long and surprisingly on time, women of all ages starting trickling in, introducing themselves and signing the participant’s list. 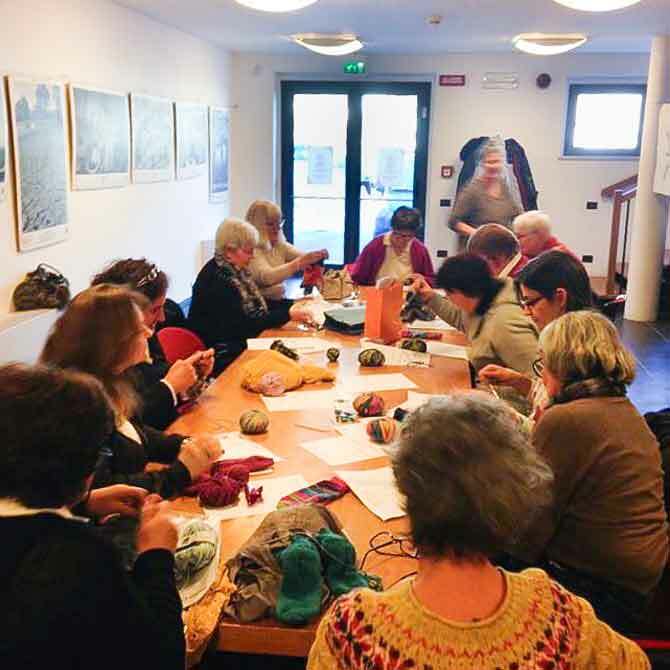 One lady, Silvana, took over the business part of the course, and was accepting money, providing change and keeping track of things, while I welcomed everyone to walk around, look and touch the socks and choose the colored yarn they wanted and a place to sit. We were 16, eager, women. Then they opened their bags, and took the circular needles out of their envelopes and looked at them. I had a knot in my stomach as I watched those unruly plastic cables twist any which way. Some had seen them before, others, it was their first time. 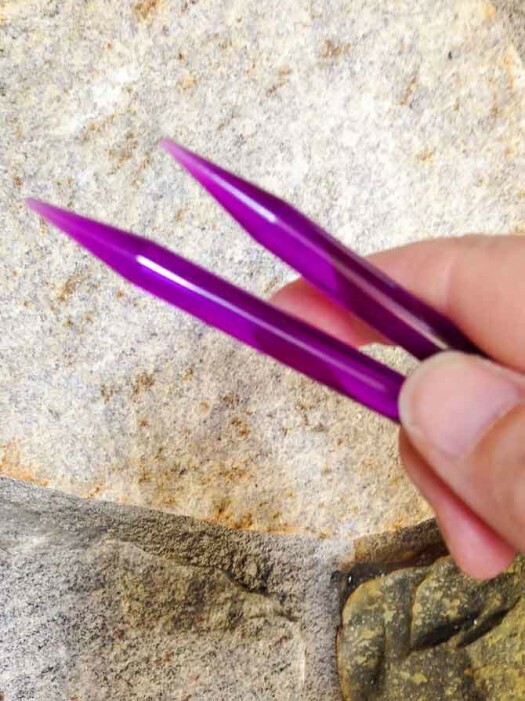 I had brought along a size 8mm purple plastic circular needles to demonstrate how to cast two toes for their socks. They all liked my colored, huge needles and wondered why they didn’t have the same. We were going to learn, a basic figure 8 cast on and the Magic Loop, which I loosely translated as the « magic ring – l’anello magico ». Nothing like creating a language within a language. I went over the course material briefly to reassure them that all that we would learn here was written down in their handout. Most said they didn’t read instructions. Oooookay, so much for that. first class, I figured we get acquainted with the needles, with each other and learn the cast on. 90 minutes later, only one person had been able to cast on 6 stitches required and knitted a couple of rows. I was sweating from the running around the table from one person to another, trying to demonstrate by either holding their hands, literally, while casting on, or showing them in slow motion, how I was doing it. What had seemed like a simple mechanical gesture in my living room, had become a complicated moment to describe. Discouragement was obvious. Everyone was sweating, and some just put down their needles and yarn in defeat. One lady gave me the bag with the course contents back and said it was not for her. I was sure I was going to have to cancel the class for lack of interest. Time was up for the first class. So I simply said, « That’s all for today. Practice at home and see you next Monday, right? » Not too sure about the answer I would get, I just started packing up. The same night, I received a myriad of messages on WhatsApp, asking for clarification on how to hold the yarns, how to make the figure 8 cast ons and other questions. Which, led me to pick up my phone, some needles and yarn, and video myself demonstrating the cast-on. At 6 the next morning, I had 10 messages waiting all claiming victory at having been able to cast on. Hooray! The following Monday, only 10 of the 15 participants showed up. In a way, I was relieved, because I never realized how unmanageable 15 participants would be. So when they all settled down and were showing their work to each other, I told them to unravel everything as we were now really starting our socks, two at a time! To practice for this, they were to take one of their balls of yarn, and take a ball from the person sitting to their right. We were now ready to cast on 2 socks! 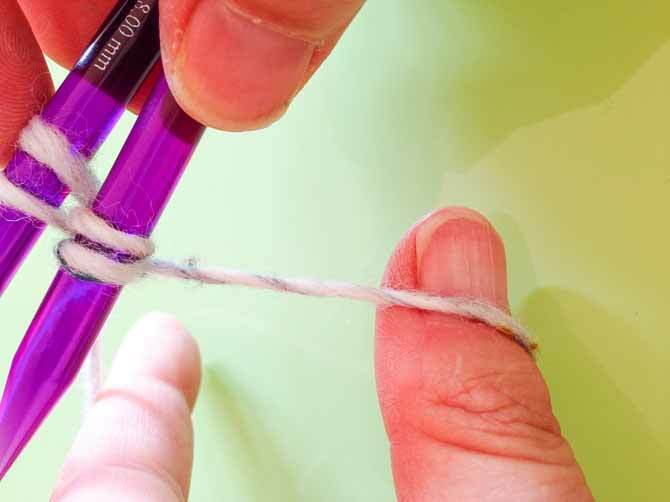 Having two different colors of yarn would help them identify their A and B socks. An awesome group of enthusiastic women, learning something knew in knitting! They looked at me in disbelief. I thought: here go another 5. 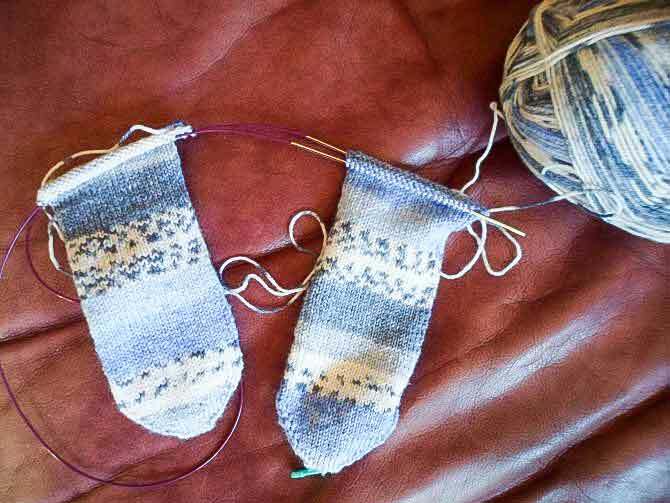 After much sweating, from all of us, and for different reasons, 90 minutes later, we had been able to cast on for two socks, and were well on our way to knitting the toe, thankfully I did not have to show how to do increases. Their homework was to knit to 5 centimeters of the desired foot length as we would be starting our short row heel. This chart, which showed approximate equivalences of shoe size and corresponding foot length was to help them out. 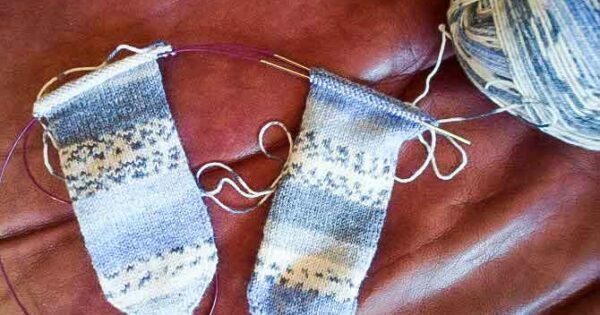 Knitting was always around me, but I only started knitting 4 years ago, when I decided to knit two socks at a time. Today, I can't imagine a day without knitting. I also like to dabble in quilting, jewelry making, writing, and teaching. On my spare time, I enjoy retirement by signing up to half marathons and all sorts of crazy morning fitness classes.